When using a router it is important to know the correct direction of feed. The following guidelines will help you to determine this. Always feed into the cutter, never with it. Routers generally run clockwise when hand held, and counterclockwise when turned upside down in a table. The easiest way to make sure you are doing things right with the table-mounted router, is to get your eye at table level and look at the bit. 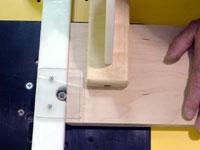 You will want to push stock into the bit so the carbide cutting edge hits the material first. When you are looking at the bit at table level notice where the carbide edge is and make sure you push the stock toward that edge, and NOT toward the back of the bit. Always use a push stick and fence whenever possible. 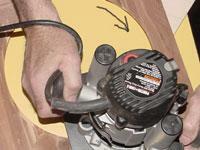 On an outside edge with a portable router, move counterclockwise around an irregular shape. 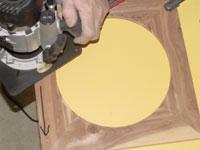 When cutting an irregular shape on an inside edge (round picture hole) move clockwise.